As soon as I visited Jokers' Masquerade I knew exactly which costumes to choose for the Mini Mes ready for World Book Day (6th March). When the book fair visits school, 'Where's Wally?' is always the first book they seek out, sit down together with and enjoy. It was always the first I looked for too with friends as a child. Trying to find the man dressed in stripes among all the other characters was always great fun and would even get a little competitive! 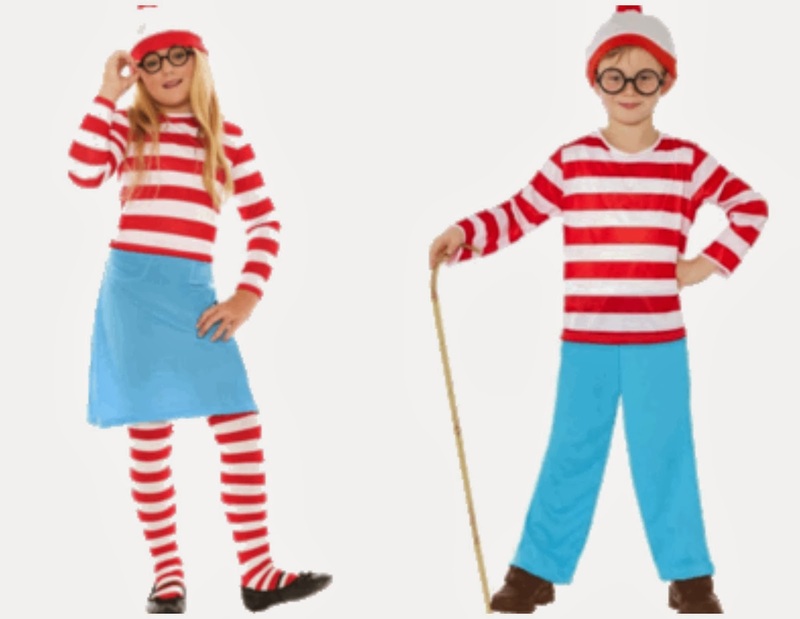 Plus, the outfits both Wally and Wenda wear are very distinctive so they really appealed. making them ideal to store away with ease before and after use. I was really pleased with the look and fit of the costumes and the elasticated waistbands on both the skirt and trousers is handy for various sized children (even though the Mini Mes are quite petite). Jamsters costume included trousers, a long sleeved top, hat and glasses. I ordered him a size medium (age 7-9) so there is plenty of room for growth without it swamping him. Minxy's costume, which includes a long sleeved top, skirt, tights, hat and glasses is a size large (age 10-12) so again should last her quite some time without it looking huge already. Each was less than £13 which I felt was good value and it saved my time attempting to make one, which to be honest would probably be unidentifiable! With various delivery options available if you need something urgently (we all leave things until last minute at times don't we?!) you can order a costume to arrive the following day. I've already got my eye on their Halloween range for October and they have some lovely ideas for hen and stag parties too. What will your children be wearing for World Book Day?